Double-click the .ovpn-file to import it to Viscosity. If you check the activity field, in the lower right corner of your screen you will see an circled padlock as an icon. That is the Viscosity-icon. Click the icon and choose to connect to the configuration file you previously imported. The icon can also be hidden if you have many programs running. If so, click the arrow in the activity field to find it. Click the Viscosity-icon again and choose to connect to the configuration file you imported. 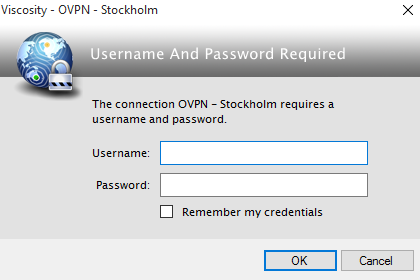 Enter your login credentials for OVPN.